What is your worst nightmare when you travel? Mine is having my luggage lost. I am one of those people for whom the carry-on rarely works. Between my two pairs of extra shoes and my toiletry bag, the carry-on is almost full. And space is not my only concern with the carry-on luggage lately. Since a few years ago when the airline industry geared up to make travelers’ life miserable, weight became an issue too. So even if I pack efficiently, I still can’t dump all I need into a carry-on because of weight issues. And so, I always end up by checking a bag. Checking a bag shouldn’t be a big problem if those involved in the process would do their job right, you know, like you would expect doctors or nurses to do their job. But your luggage can’t breath and can’t bleed, so its faith is in the hands of people who sometimes check your passport holding it upside down. If you are one of the few lucky ones who never had their luggage lost, then you can’t understand the stress and frustration you feel when your suitcase fails to appear on the baggage carousel. Yes, the airline will offer you a compensation if your luggage is never found, but what about if it’s found a week after you return home from your trip? You’ll get a $50 check to cover for some emergency items the airlines considers you were entitled to buy since your suitcase didn’t arrive. Believe me, nothing ruins your vacation like a no-show luggage. Research from SITA –the creators of the World Tracer System for baggage– found that 24.1million bags have been mishandled (lost and temporarily mislaid) in 2014, a figure that translates as 7.3 bags per 1,000 passengers. How is that for your reassurance? The same research found that of the 24.1million lost bags, 49% went missing due to “transfer mishandling,” 15% because of “failure to load”, 15% due to a “ticketing error” and the rest due to a mix of tagging errors. 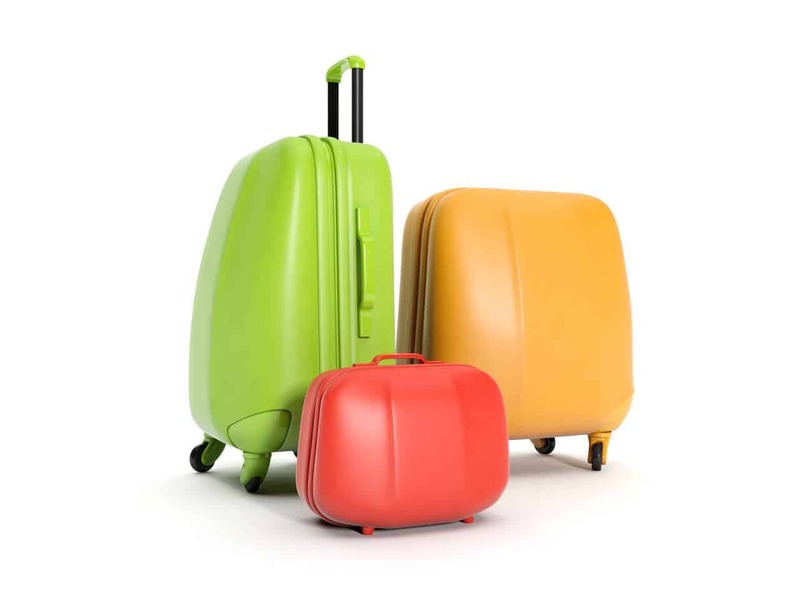 So what can you do to prevent your luggage from being lost? Microchip it! In July, 2014 ReboudTAG was created as a new technology to help recover lost luggage at the airport. 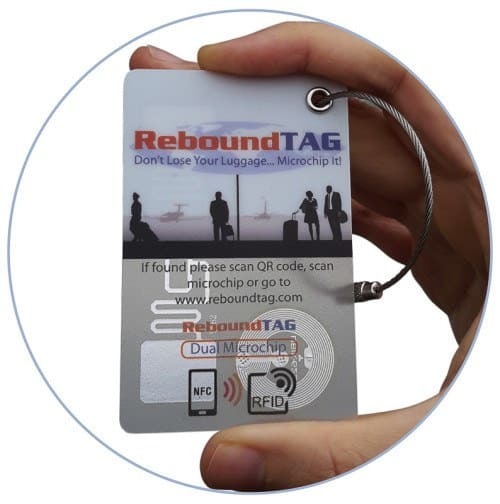 ReboundTAG is the first microchip luggage tag that works in all airports worldwide. This is achieved by using multiple layers of technology in a single tag and integrating with global baggage handling systems. ReboundTAG has been showcased by Lufthansa at the Annual General Meeting of IATA (the international airline regulator), as a way of preventing lost luggage globally. 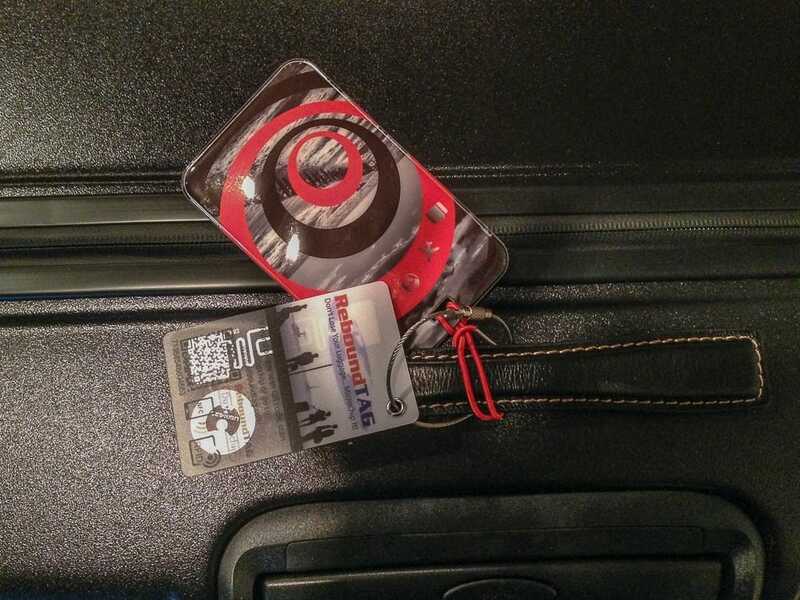 Two different RFID tags are used in ReboundTAG: one is a digital identifier that tells the system who the bag belongs to; the other can be reprogrammed with your travel details each time you arrive at a desk and check your bags. ReboundTAG is also equipped with a printed barcode and number that can also be used. Best of all, should the bag get lost, the owner of the luggage is alerted of its location in real-time via email or SMS and receive updates about the time when the bag will be delivered. Retail price for one tag is US$31.99. Price includes 1 year membership, after this the individual pays their own membership fee of $4.99 per year. The membership includes unlimited use and unlimited updates from the company and the baggage handling company partners when the bag is found. ReboundTAG was designed for travelers and companies alike. It means that a bag is protected worldwide when a person travels. 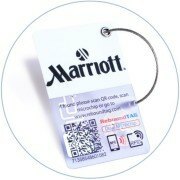 It is a sleek, sturdy and easy to attach tag, that will fit nicely next to your name tag on your suitcase handle. ReboundTag is not an anti-theft device. If your luggage gets stolen, the microchip tag can easily be removed to prevent recovery. ReboundTag is intended to protect your luggage from being lost forever in the airport while you are traveling to/from your destination. It will also help you recover your bag faster if it’s mishandled. Losing luggage is the worst. This sounds like a good reasonably price way to prevent it. Thanks for sharing. Since I have the ReBound tag my luggage hasn't been misplaced, ha,ha,ha! RFID on my luggage tag! that is one great idea. But I dont I should display it outside my luggage? What if the thief just cut it off? I experience missing luggage in NZ and wouldn't want to happen again :( This would be a great help! Like I said in my post, Carla: the ReboundTag is not for theft prevention, it's for locating your luggage when it gets lost and for speeding up the return. Thank you, Linda. I'm glad if you found useful my post. Finding shoes is difficult for me too, especially since I am looking for both comfort and style. Interesting and what a great idea. Can the Airlines track your baggage with this or can only you track it? How many places do the baggage handling companies operate in? We are headed back out on the road within the next 6 weeks and I will have to look into this further. Great idea--although nowadays I pretty much always travel with just a carryon. It would be good for long-term travel when you need to check bags and can't afford for them to go missing. This is such a good idea! Losing my luggage actually terrifies me... I was a huge b*tch to a woman who worked in the airport in KL a few years back when they lost mine and I can't believe how upset I was over a lost bag. I feel so ashamed! Oh my word I would feel so much better about checking my luggage with this! I've had my bags go missing (but eventually arrive) twice (maybe 3 times, I might be repressing the memories!) over the years and nothing is more stressful. And it's pretty reasonable priced too - do you know if the ReboundTag is available in Australia? It's available all over the world. Just click on the link in my blog and you'll be redirected to their website, Vicki. Love this idea of having luggage tracker. Finally! You luggage not arriving with you is never fun. Will have to look into this option for my future travels. Thanks for sharing this new technology. Checking luggage is always a gamble. The Rebound tag seems like it would improve the odds in our favor! Now if we could just get some sort of an improved cooperative system for those of us whose itineraries always seem to pull multiple airlines who can't ticket your luggage through to its final destination. ReboundTAg would work with any kind of itinerary and connecting flights. Remember, you can get online and update your itinerary every time before you live. Brilliant! The initial cost may seem a bit pricey if you don't travel often but for those that do it's more than worth the price. Very cool product! I am always worried especially for connecting flights that my luggage would go missing. Cool concept. We are heading your way next month, and my goal is to do all carry on for 6.5 weeks. Will I succeed? That is the big mystery. You may succeed, Rhonda, if you are determined to use only one change of cloths for 6 weeks. Great idea...finally. So glad someone put it into play! You're right about lost baggage being a nightmare. I've become a minimalist packer just for that reason! I thought this tag is a great idea too, Tami. I had my baggage mishandled several times so far and every time it took at least 24-48 hours to retrieve it.